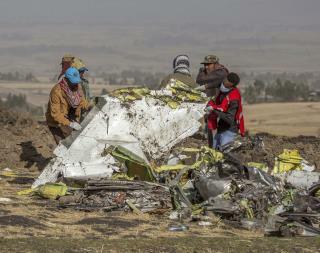 (Newser) – The pilot of Ethiopian Airlines Flight 302 knew he was in serious trouble soon after the doomed flight took off from Addis Ababa on Sunday, a source who has reviewed air traffic communications tells the New York Times. Captain Yared Getachew calmly reported a "flight control" problem a minute after take-off, but sounded panicked two minutes later when the Boeing 737 Max hit an abnormal speed and dipped up and down hundreds of feet. "Break break, request back to home," he told controllers. "Request vector for landing." Minutes later, the plane crashed, killing all 157 people on board. It sounds like they were testing the plane, or whatever software glitches it has, on him! Not to make light of the crashes but from what I've read the problem sounds like a problem is in the AP,auto pilot.A well trained pilot with a little composure facing a possible lethal accident would switch off the AP immediately and fly manually.Possibly in some"shithole countries".Mr. Trumps words,not mine.Pilots are not trained to actually take off and land manually,especially a new piece of equipment. "amid fears that a software flaw caused this crash" And this is why I do not want to buy a new car.